The findings in the C-Suite Challenge™ 2018 result from a survey of over 1,000 business leaders about the top challenges facing their organizations in 2018 and the top concern of CEOs is attracting and retaining talent. With many economies doing very well, and the working-age population remaining stagnant, the war for talent could get even more competitive. According to The Conference Board, "By 2019 labor market tightness could reach levels not seen for decades especially in the US, China, Japan, UK and several countries in Central and Eastern Europe. With the large generation of baby boomers continuing to leave the labor force in large numbers for 10-15 more years, labor shortages are likely to get worse before they get better, and may become a drag on growth if governments and employers are not able to accelerate their capacity to produce. " CEOs are tuning into the most recent results of the Global Talent Competitiveness Index (GTCI). Launched in 2013, the GTCI is an annual study ranking countries and major cities on their ability to attract, develop and retain talent. They look to the report to develop talent strategies and overcome talent gaps and mismatches as they seek to be more competitive in their quest for the best talent globally. So, which places are growing the best talent? Who is creating talent environments that attract and retain critical employees that are the key ingredient to maintaining a competitive edge, to innovating and to growing profitably? GTCI is an annual benchmarking report compiled by international business school INSEAD with The Adecco Group and Tata Communications. 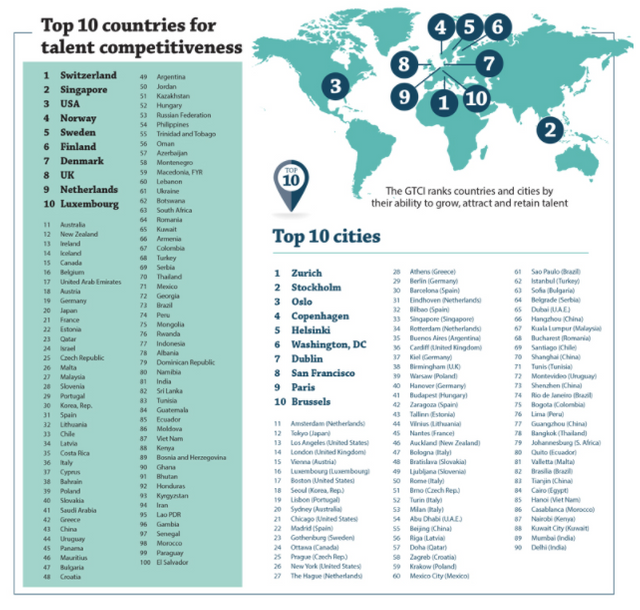 It measures and ranks 119 countries and 90 cities based on their ability to grow, attract and retain talent. Here’s a closer look at the places that came top in the 2018 ranking, which was released at the World Economic Forum Annual Meeting in Davos. How do design thinking and mobility intersect?